This post originally appeared on TakePart World. By Esha Chhabra. Esha is a journalist who covers social enterprise, technology for social impact, and development. Forward thinkers in development gathered this week to discuss what’s next and what could be done better. 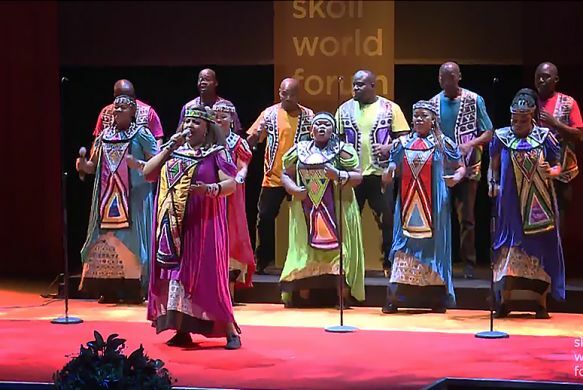 The Skoll World Forum is a type of watering hole for the world’s do-gooders—a coming together of philanthropists, entrepreneurs, investors, artists, and technologists from across the globe. Sponsored by the California-based Skoll Foundation, the forum convenes every year in Oxford, England, at the Saïd Business School’s Skoll Centre for Social Entrepreneurship to ask some critical questions about global development: What’s next, what’s missing, and what could be done better? “If there is a silver bullet in this world, it is girls’ education,“ said Skoll, who funded a new documentary on Nobel Peace Prize winner Malala Yousafzai. One of the four Skoll Awardees this year was Safeena Husain, the founder of Educate Girls, a social enterprise that operates in districts of India with massive gender gaps. The organization works with village communities to get more girls into school and make sure they stay enrolled. After receiving her prize, which includes a grant of $1.25 million, Husain said, “The dialogue [on girls’ education] is building up. The time is now. Every single girl I meet wants to go to school, and that for me is the biggest source of hope.” Husain hopes to help 4 million students in India by 2018. 2. Think big, infrastructural change. “The key is building and changing systems, rather than isolated initiatives,” said Ophelia Dahl, executive director of Partners in Health, at one of the sessions. To do that, collaborating with governments is key. Tim Hanstad, president and CEO of Landesa, an organization that works on the land rights of marginalized people, agrees. “There are other pathways to scale. But the government has to be involved. One should not go around the government but partner with them,” he said. Harvard professor Michael Porter has been measuring the success of countries beyond gross domestic product. The Social Progress Index, which he announced at the Skoll Forum three years ago, ranks countries based on basic human needs such as food and shelter, access to education, health care, civil rights, inclusion, and opportunity. (Norway comes out on top, and the Central African Republic is last.) Porter’s conclusion: GDP is important, but the focus should also be on quality of life. 4. Agriculture and technology are colliding. In India, where 70 percent of the population lives in rural areas, two examples have emerged: Digital Green produces informational videos for more than 600,000 farmers on agricultural practices, health, and nutrition—all meant to help improve their livelihoods. The Boston-based Barr Foundation backed an alternative fuel company using pine needles from the Himalayan states of India; collecting the pine supports the employment of a local labor force. 5. To ensure the planet’s future health, we need to work together. As cities continue to grow—and populations in the world’s largest metros hover around 20 million—creating a high quality of life becomes a daunting task. The Skoll World Forum and Johnson & Johnson teamed up to focus on cities and the health of residents. As a result, about 2,000 factories have taken notice and are now trying to ensure their manufacturing process is as clean as possible. Notable brands include Apple, Hewlett Packard, H&M, and Gap. 6. There’s no need to reinvent the wheel. Immense creativity and innovation exists at the local level; there is no need to reinvent the wheel, so to speak. Change can be more effective when funding and bolstering existing organizations that already have local know-how. 7. Impact investors are still a drop in the bucket. While the chatter around impact investing is growing, Vineet Rai of Aavishkaar, one of India’s primary impact investing funds, isn’t convinced. There’s more talking than doing, he said.